Here’s a disturbing article from today’s Toronto Star: "Pride Week, MP Under Fire After Tory Outcry" http://www.thestar.com/news/canada/article/662566 Looks like some of Stephen Harper’s caucus are concerned that Toronto’s Pride Week doesn’t provide enough bang for its stimulus buck. Or something like that. Diane Ablonczy, MP for Calgary-Nose Hill and currently the federal Minister of Tourism (although that might change any moment now), is pictured in the Star article attending and event with Pride Week organizers, handing out approximately $400,000 on behalf of her Ministry. A "burlesque performer" also appears in the photo, and is referenced by someone quoted later in the Star article as a "drag queen". Apparently, this picture, and coverage of the event, caused a bit of stir in the hearts and minds of Conservative MP’s, although Brad Trost, MP for Saskatoon-Humboldt, raised only the issue of the effective use of stimulus funding. Let me be clear about one thing here. Toronto’s Pride Week, along with Caribana, are probably the two most wildly successful events in all of Canada for injecting large sums of tourism dollars into the economy. Other events referenced in the Toronto Star article, like the Calgary Stampede and the Vancouver Jazz festival, pale in comparison in terms of the number of visitors they attract. Toronto’s Pride Week is clearly a big-time festival on the world stage. Perhaps the MP for Saskatoon-Humboldt, whose likely never attended Pride Week festivities, doesn’t have an appreciation for the sheer size of the injection Pride Week puts into the Greater Toronto area’s economy. Which leaves us then with an MP posing with a drag queen handing out government money. First, though, kudos where it’s due. The Toronto Star reports that Ablonczy was so impressed with Pride Week’s application that she just had to go in person to hand them the cheque. She probably didn’t think twice about anything other than what a wonderful photo-op that would be for Conservative voters in the GTA. Clearly some within the Conservative Party are questioning the Minister’s wisdom to associate the Conservative Party with anything "gay". Nevermind that it wasn’t Conservative Party money being handed out to Pride Week organizers, but instead money from the Government of Canada. This type of back-lash from Conservative MP’s makes me more angry than I can adequately express in this post. It’s intolerance such as this, displayed by some of our elected leaders for crying out loud, that absolutely infuriates me. Now look, I was never going to vote for Stephen Harper’s Conservatives anyway, but I’ve always considered myself to be more than a little concerned about the economic health of our great nation. Conservatives like to posture that they’re the only ones who know what’s best for Canada’s bottom line (which is an outrageous assumption for them to make, but it does appear to resonate with Canadians). What angers me is that Conservatives will continue to tell Canadians that they’re the best to manage finances, that the other Parties are only going to raise taxes, so you’ve got no choice but to vote for us. But part of the bargain when you vote Conservative is you’re going to get a bunch of socially regressive dinosaurs, who don’t really believe in tolerance. Conservatives cry to the media and to the people of Canada that they do not have a hidden agenda. Well, they don’t. It’s right out there in the open for all to see. And this latest attack on Pride Week and muzzling Minister Diane Ablonczy is completely in line with their way of thinking. Greens, we all know that we are an alternative to small "c" conservatives in terms of having a viable and sustainable economic plan for this country. And we know that those who consider themselves socially progressive would be very much at home in our Party. We must continue to poach former Progressive Conservative voters, it’s that simple. Maybe Diane Ablonczy will be looking for a new home in the near future. Generally I accept that Reform types are entitled to their opinions, and while i disagree with much of what they champion, it takes all kinds to make a country. There are just too many areas though where they intrude as arbitrers of MY morals, I take it as an assault on my liberties. There are few clearer examples of bigotry driving public policy than this, and we should not let the electorate forget it this time. CPC = Reform. Thanks for your comment, bluegreenblogger! When I wrote this piece earlier today, I was in a really foul mood...it's stuff like this which really burns me up. Since then...well, I guess I've remained in a foul mood all day. So I appreciate reading your comments just now, as I know I'm not a lone p.o. 'd voice out here in the blogosphere. I was in the Ottawa Pride Parade as a Green candidate in 2007 and it was a hell of a lot of fun. The best part was having young greens chant to the crowd "Which Party had the first openly gay leader? The Green Party!" And then the crowd looked at Frank De Jong, marching beside me. Frank wasn't the leader in question, but he was having a great time at the event, and took the cheers. I've asked all local Greens in Ottawa to participate this year. 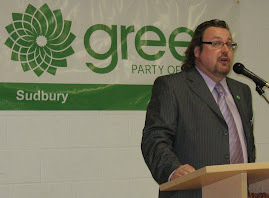 I agree that the opportunity for the Greens is to be fiscally conservative (more so than the current gov.) - but socially progressive i.e. march in the Pride Parade.